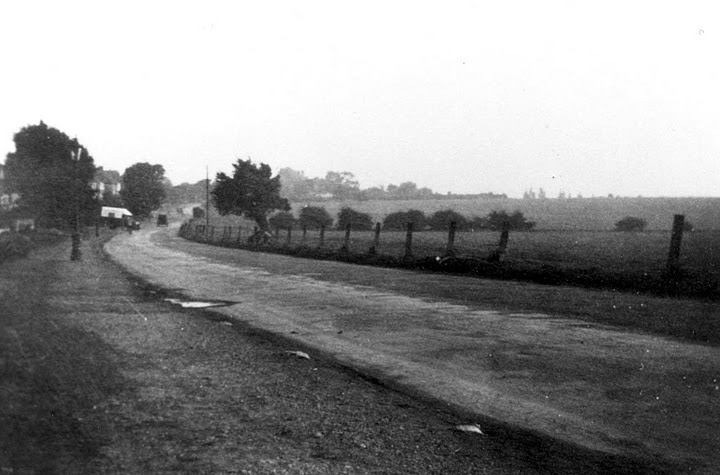 Burnt Ash Farm, stood at what is now a busy road junction – that of Baring Road and St Mildred’s Road. The site has an interesting history – it moved from medieval settlement to being a farm, to a dairy in the 1920s, being taken over by United Dairies, before being sold to Dairy Crest in the 1990s. It survived attempts to turn it into a Big Yellow Storage facility before being developed for social housing around 2013. 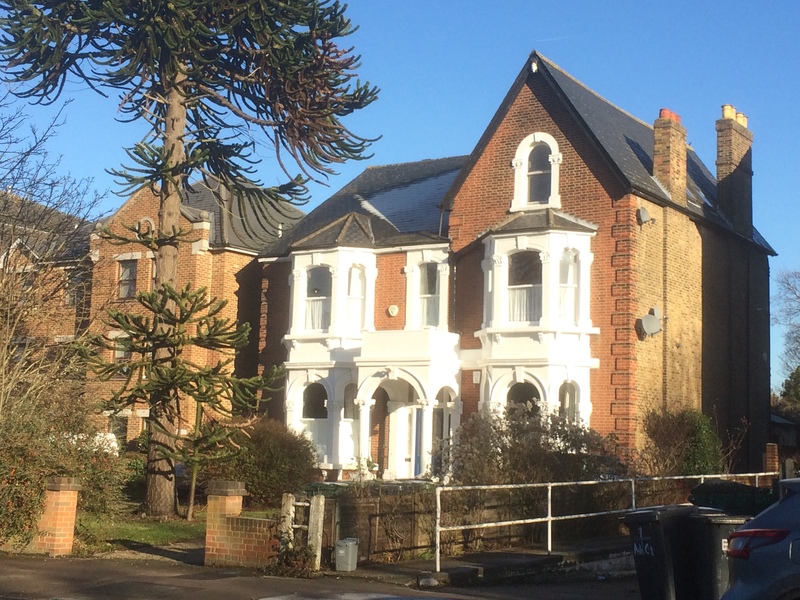 The farm wasn’t always on Baring Road, until the beginning of the 20th century it was known as Burnt Ash Lane (it still is on the Bromley side of the border) – the Barings (Northbrooks) were the local landowners who owned the Manor House and whose wealth had its roots in slavery. It wasn’t always in that location either, it was originally located in Old Road, Lee, almost certainly situated at what is now the Lee Manor House and was known as Lee Farm; it seems to have moved around 1727 (1). 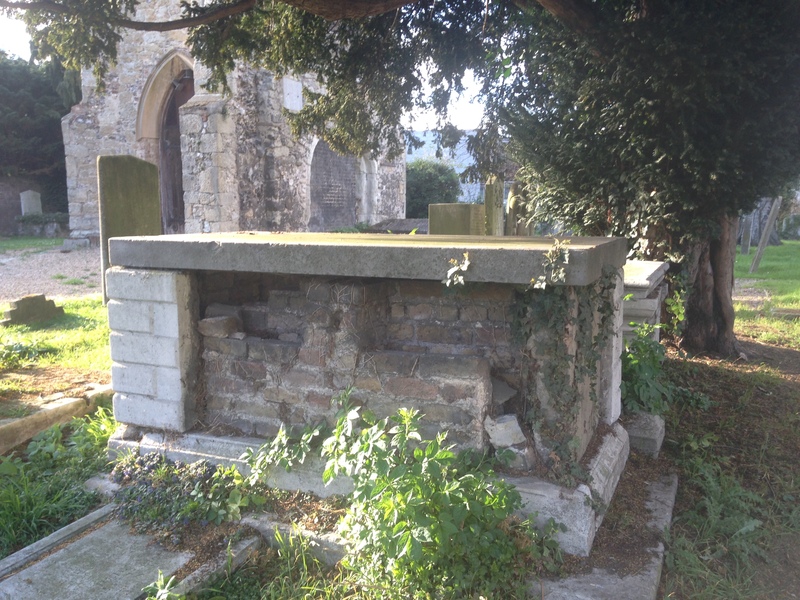 It was farmed by Thomas Butler, who is buried at St Margaret’s Lee, having died in 1733. 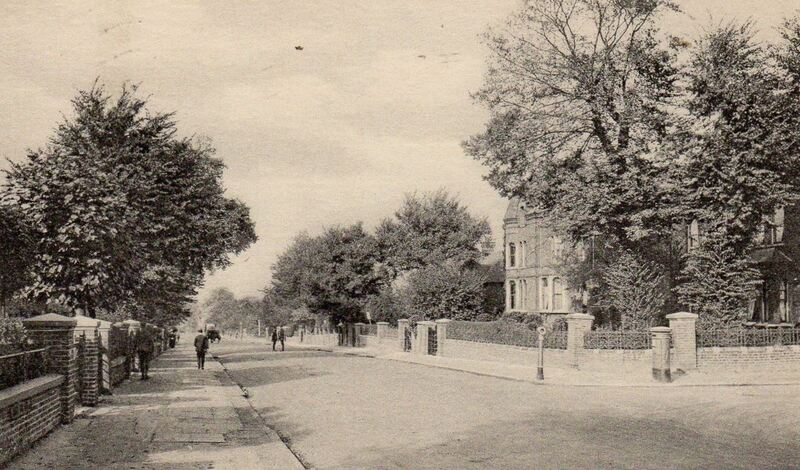 It was a substantial farm at this stage, its land running from around what is now Lee High Road to the current Grove Park (2). 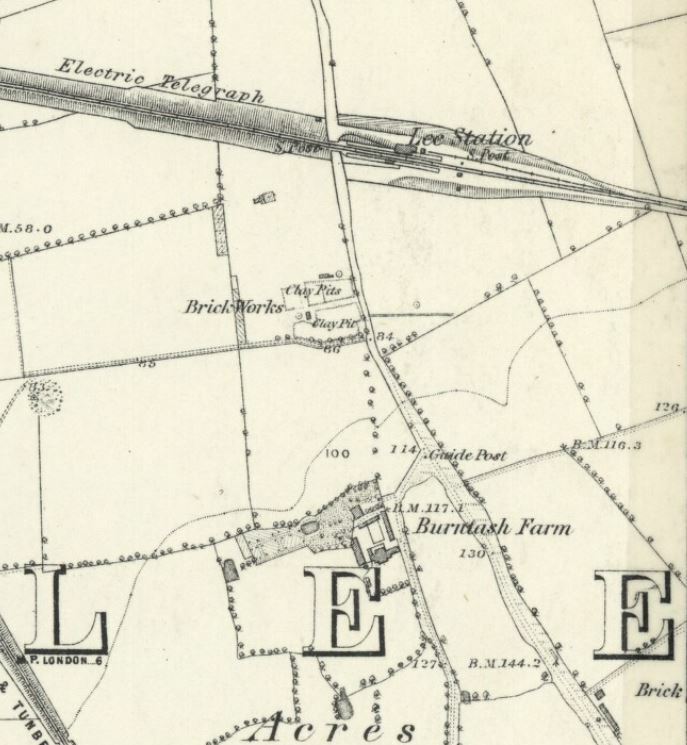 The farm seems to have been split after Thomas Butler’s death between two of his sons with the dividing line being drawn around St Mildred’s Road (3) – Matthew who stayed at Burnt Ash Farm and James who set up a new farm, Lee Manor Farm, around the junction of Manor Lane and Manor Lane Terrace (4). Running Past will return to Lee Manor Farm in the future. The farm buildings at Burnt Ash were clearly marked on John Roque’s 1746 map (on a Creative Commons via Wikipedia). series of pits, postholes and ditches indicating that people were living and probably working on the site in the 12th century. The majority of the finds are shards of pottery from serving and cooking vessels that were manufactured in Surrey. This indicates that trade routes may be focussed to the southwest rather than the City of London. Whether this early settlement was abandoned soon after this, or perhaps as a result of the Black Death is unclear – an early incarnation of Hither Green, Rumbergh, disappeared at this point. Certainly woodland covered the area from the 14th century until the early 18th century. The name, Burnt Ash, comes from coppicing of wood for charcoal manufacture and was first mentioned in Assize Rents in 1384 and in a 1607 description of Lee Farm, with a section of Woodland called Crabland Spring. Certainly by the time Rocque surveyed the area, the woodland was gone. Returning to Burnt Ash Farm, the farm was further subdivided in the early part of the 19th century (5), presumably after the Barings bought both the Manor House and the land portfolio that had been put together for and by Thomas Lucas. The history of the farm during the first half of the century seems a little sketchy – but it was still a substantial operation of 367 acres in the 1839 tithe schedule, when the farmer was Richard Norman. 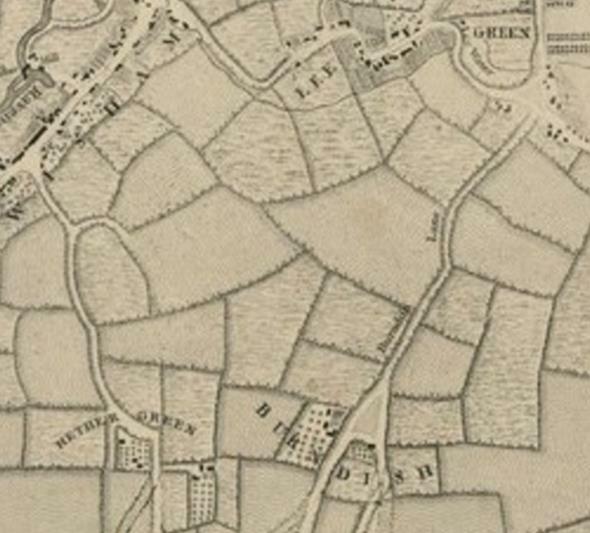 While the location of most of the fields is unclear, Josephine Birchenough with John King identified the locations of some of the fields – Grass Buntins was broadly where Northbrook Park now is (6), Red Robin was on the western side of Baring Road (7); Ivory Down and Buntins were roughly where the Hither Green Cemetery is now (8). 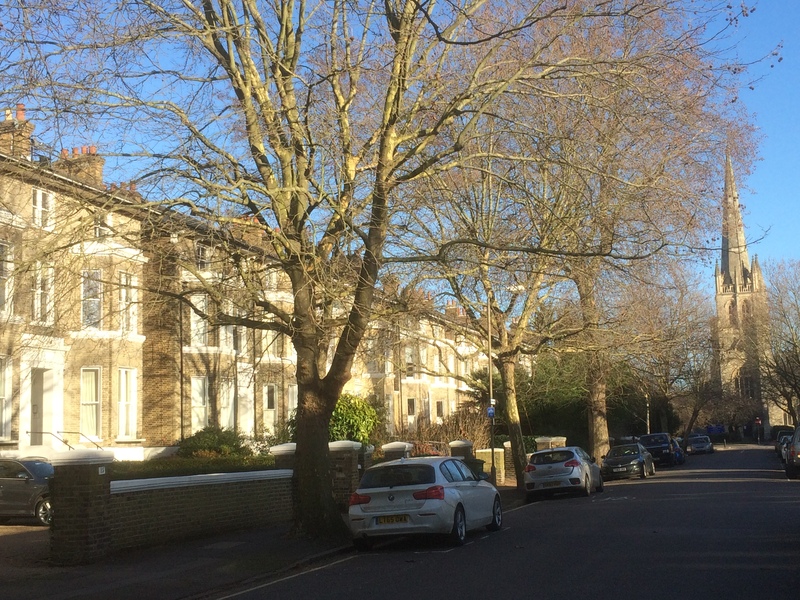 Ivory Down lives on in a road name on the Downham estate. Norman had certainly been at the farm for at least a couple of years before the Tithe schedule was compiled, as he had been the farmer when the ‘unfortunate Mr Cocking’ was to become the first parachute death when his own design failed to work and he hurtled to his death on the farm – the sad story was covered in Running Past a couple of years ago. 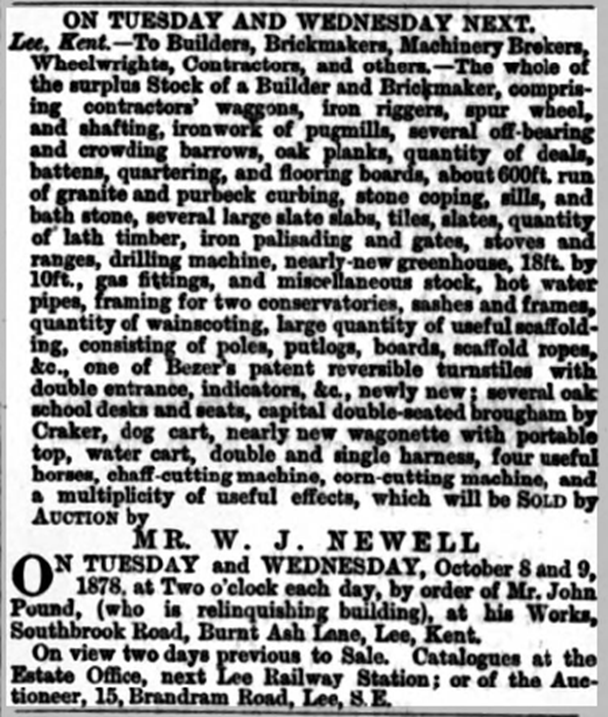 Richard Norman was move on from the farm in 1844 – there was a farm sale of some of the livestock and equipment – oddly advertised as ‘Live and dead farming stock’ (9). It isn’t clear who was farming there in the 1851 census as records are a little confused, however, by 1861 census two farmers are listed at the start of Burnt Ash Lane in the census records – the Adams and the Uptons. Thomas Adams, born in 1806 was listed as a ‘farmer of Farmer of 72 Acres employing 3 Men’ (the acreage is probably incorrectly recorded – it may have been 272) and his family including Edward (1837) who was also working on the farm. The three employed may have included some of the Uptons – this included John who was 69 ‘Farmer No Occupation at Place’ and his son Stephen 45 who was listed as a farmer and dairyman. The Upton left during the 1860s – they were to move onto Durham Farm at Grove Park – where they stayed until at least 1901. The Adams too moved on soon after the census, as by the mid-1860s Zephaniah Seal seemed to be the tenant farmer as there were several cases involving the theft of a horse, embezzlement and theft of hay in the mid-1860s when he was listed as farmer or master. Seal’s father, John, had earlier been a dairyman on the farm. 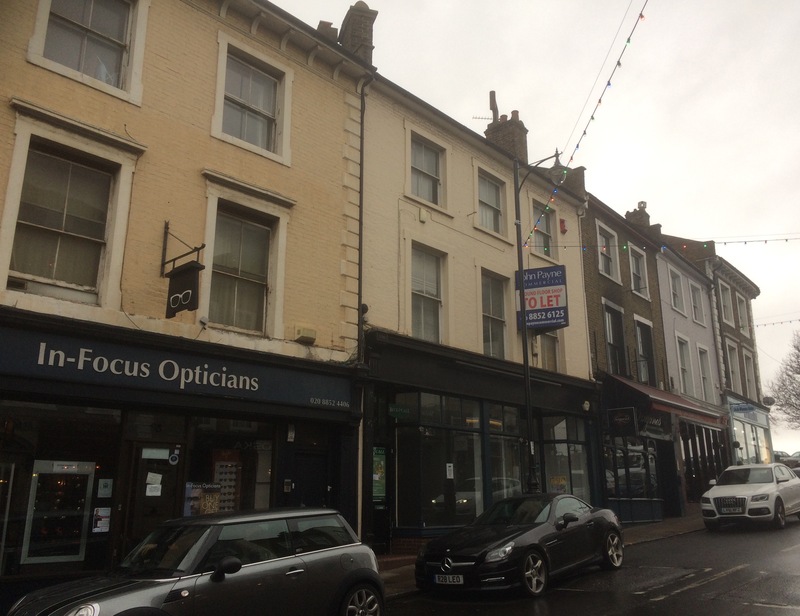 Seal had been previously living with his parents in Lee Church Street. A William Winn (or Wynn) certainly acted as bailiff or manager for the Seals for a while, he was in the area and possibly at the Farm from around 1850 as his younger children were born around Lee – he was mentioned in one of the court cases and died at the Farm in 1863. Whether he related to the William Winn who developed the area around Guibal and Winn Roads in unclear. 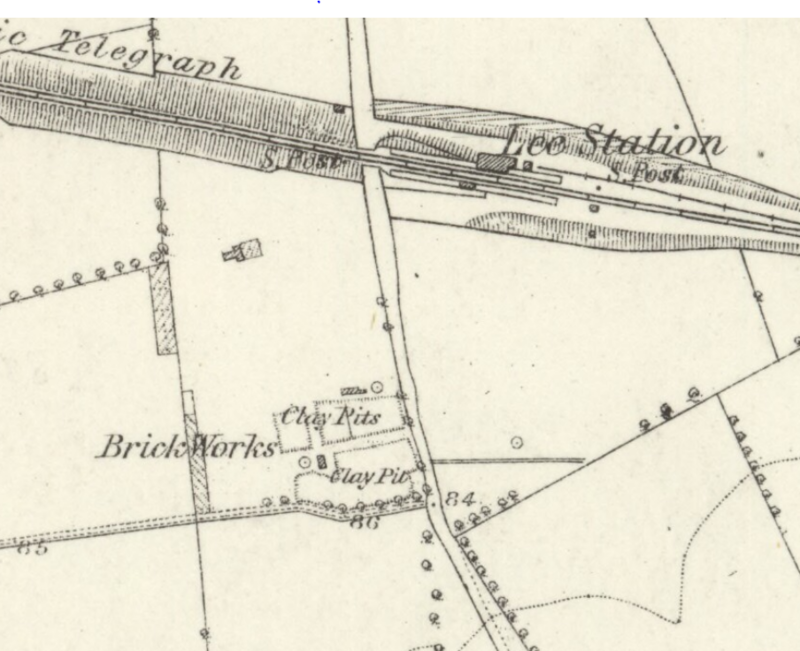 The farm and the newly built Lee station are shown on the map below published in 1870 (on Creative Commons from National Library of Scotland). Zephaniah Seal’s brother, Charles Frederick (1827) was listed as the farmer in the 1871 census with William Warwick living in a cottage on the farm – there is no trace of Charles after that, although Zephaniah was back at Lee Church Street in the 1880s on electoral registers. 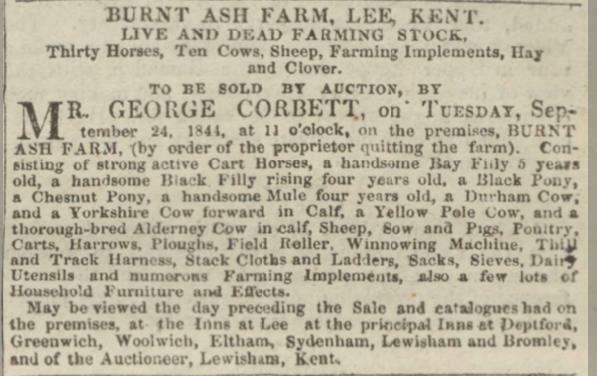 Charles Seal had moved on by 1874, at the latest – another Adams family were farming Burnt Ash Farm, Thomas who hailed from Leighton Buzzard, one of his children were born on the Farm in 1874. 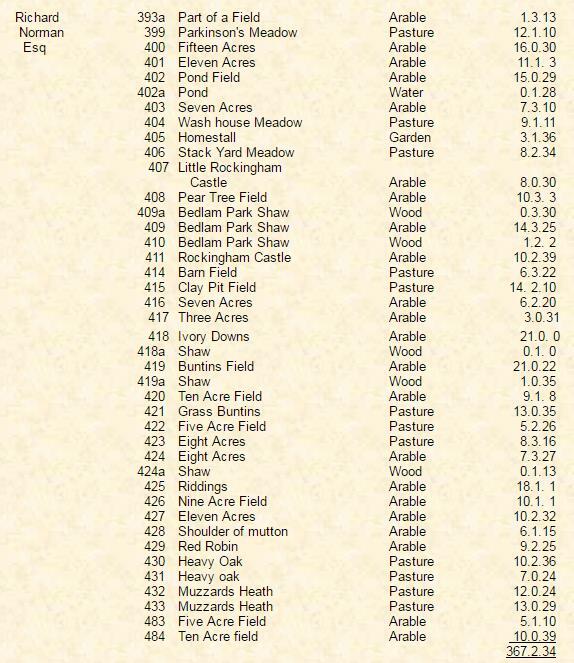 The farm was listed in the census as 274 acres and employing six men and two boys. It is not clear how long the Adams Family stayed but by 1893, there were two registered cow houses at the farm – one run by Cordwell and Sons the other by W. H. Carter – the farm was still owned by the Northbrooks. By the early 20th century the farm was being run and probably owned by the Edwards family – Public Health Reports listed them having 56 cows Burnt Ash Farm – they were being farmed as a joint operation with a few other local farms including College Farm – covered before in the blog. Edwards and Sons were a relatively large scale dairy enterprise with 60 shops around SE London. Some of the fields still farmed at that stage are in the postcard below (eBay November 2016). The Edwards tenure seems to have lasted until Burnt Ash Farm closed in the 1920s and their shop operation appears to have been taken over by United Dairies. What happened the Farm is a little sketchy after that – the buildings seem to have been retained (they were still showing on a 1946 published Ordnance Survey map) and it was controlled by the Milk Marketing Board, probably still as a dairy. 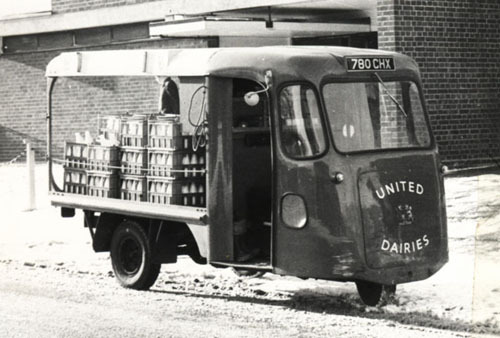 However, during the 1950s, the milk depot was largely re-built (although a couple of the farm buildings were retained (10)) and was initially operated by United Dairies – at its peak they ran 54 rounds with milk floats going out on their rounds by 6:30, returning by early afternoon. 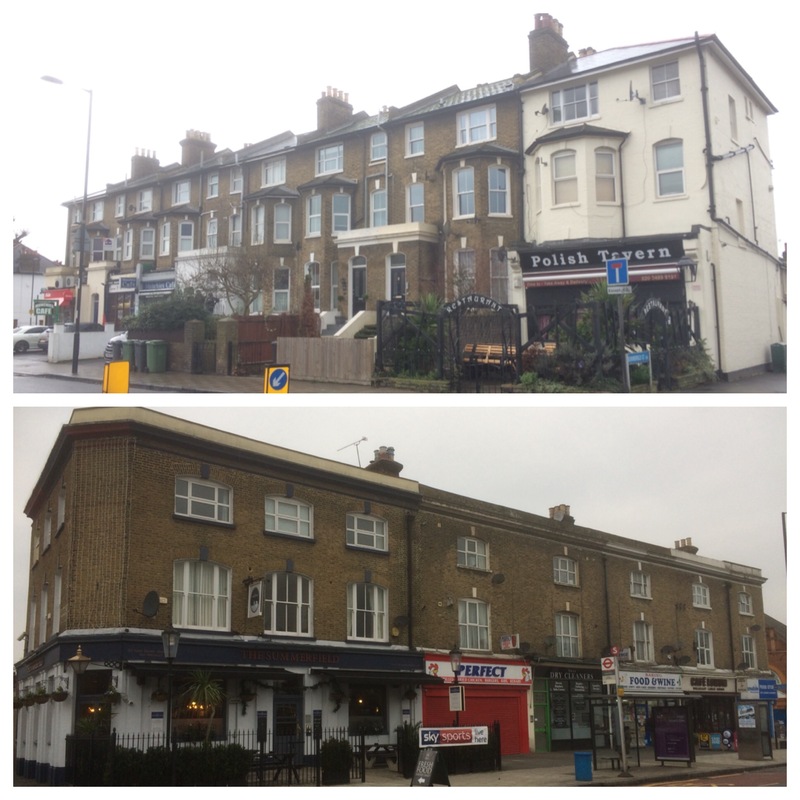 It served a large area of south London with deliveries going as far as Waterloo Bridge, Sydenham, Bromley and Woolwich. 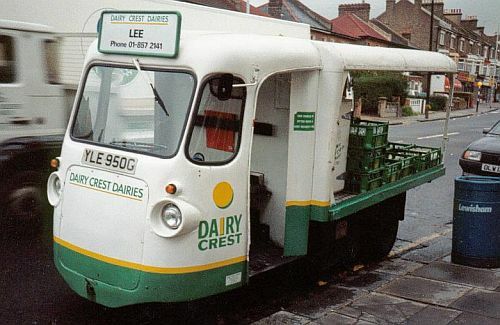 The milk float below is typical of United Dairies, although not specific to Lee (11). United Dairies merged with Cow and Gate to become Unigate in 1959. In a contracting sector there was some rationalisation and the depot was sold to and run by Dairy Crest from 1989 until its closure in September 2000. By that stage only 25 rounds were still in place when the milk float, like this one below (13) pulled out of Baring Road for the last time. After the closure the site was demolished in 2001 and there were attempts by the Big Yellow Self Storage Company to build a warehouse on the site. 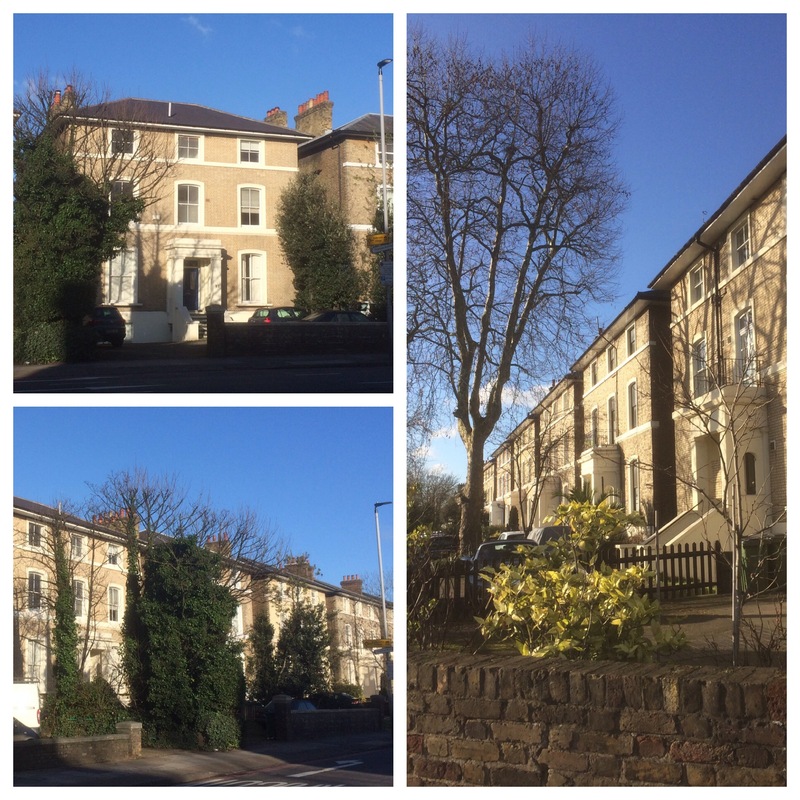 There was long running opposition to proposals which were finally defeated at Lewisham’s Planning Committee in 2006. In the end Big Yellow built on a site at the Land of Leather/Cliftons Roundabout a mile further along the road. 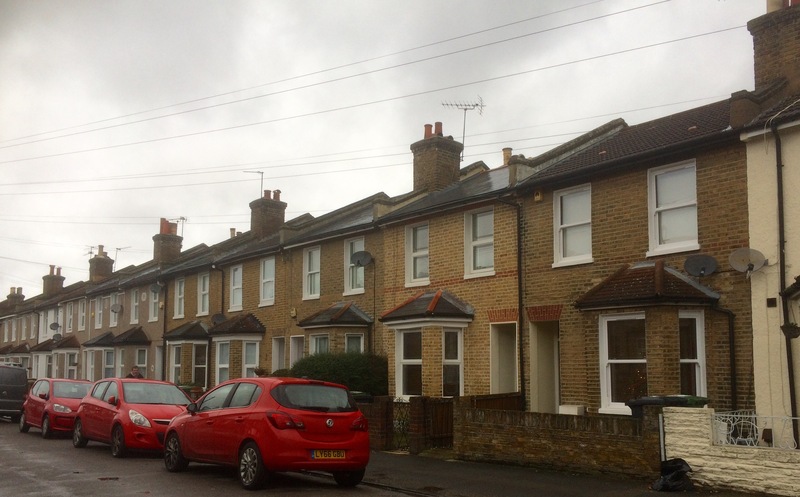 The site was eventually purchased by developers who developed the site on behalf of a housing association with work finished in late 2013. 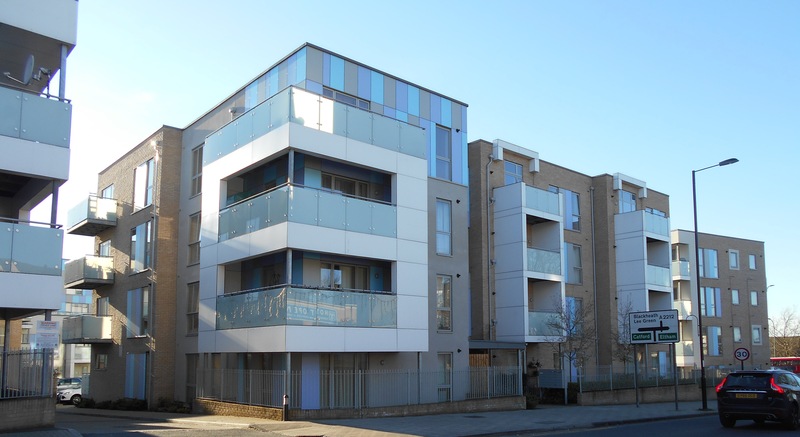 It is one of the more attractive recent housing developments in the area, although the duck egg blue glazed balcony panels on will probably make it quite easy to date for future architectural historians. One of the people who made the housing association scheme happen was my friend Martyn Brindley, Martyn was a lovely man with a great commitment to high quality social housing which both looked good and worked well for the residents. 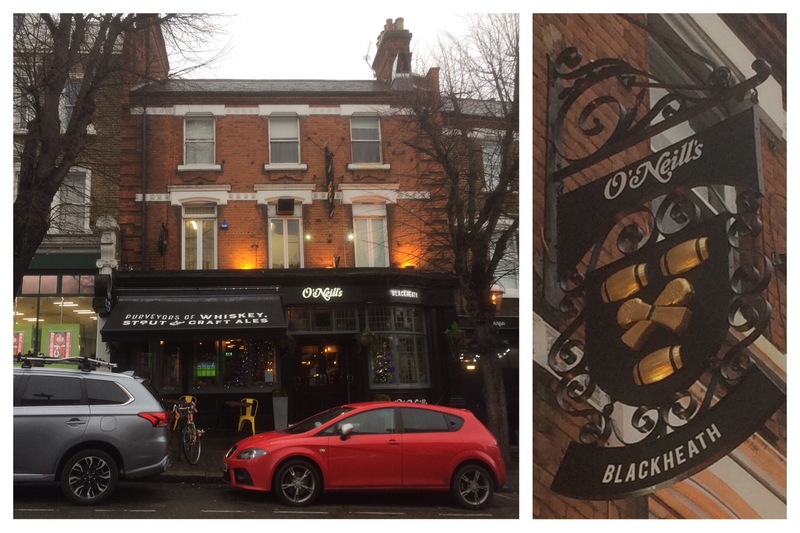 Sadly, Martyn died a few weeks after I wrote this post – hopefully this scheme and several others in the area will be fitting and lasting tributes to him. 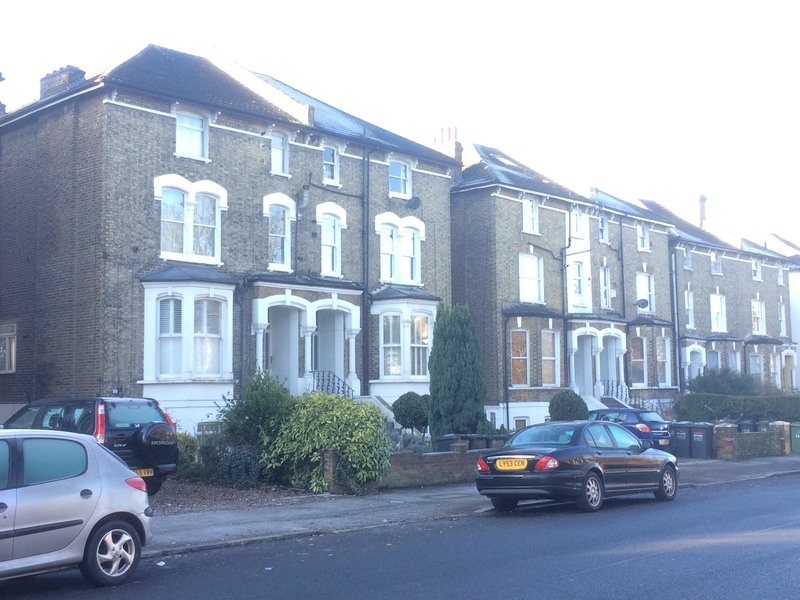 This entry was posted in Lewisham History and tagged Baring Road, Burnt Ash Farm, Dairy Crest, United Dairies on April 12, 2017 by Paul B.